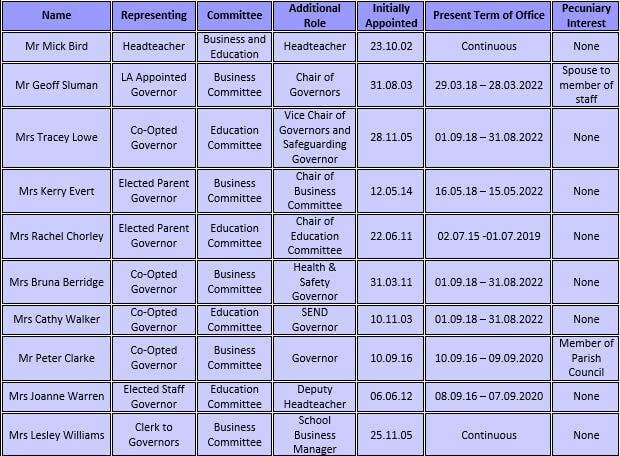 Governors are appointed as strategic managers in such matters as school premises, finance, teaching and non-teaching staff and the general development of the school. Termly governors’ meetings are held to consider a variety of items affecting the school and to receive reports from the Head Teacher regarding school improvement. There are two sub committees of the Governing Body. The Business Committee and the Education Committee. Chairs of each committee are elected annually in September. The governors can be approached by all members of the school community if they wish to give feedback about particular school issues. Govenors who have any relevant business or pecuniary interest make a declaration at every meeting, with an annual register being completed in September each year. ​No governors have a close relationship with each other and no governor holds a governance post in any other educational institution.